Is Friday the 13th a holiday? Got that? Now fear of Friday the 13th is a genuine disease. I’m pretty sure I don’t have it because as superstitious as I can be about certain things, I’ve never cared one way or the other about numbers, cracked mirrors or hockey masks. But wanting to mark the moment in some way made me think of food and of course that led to baking and then a search for some kind gruesome looking components with a small side line search for someone to give the baked goods to since we just rid the house of cupcakes and still have some brownies hanging around. Problem 1. What to make. A very short internet search led me to some truly appalling foods. Vienna sausages shouldn’t “float” in anything, no one should spend any time peeling grapes and when you fill dates with cream cheese and chopped walnuts and call them “roasted cockroaches” I put my foot down. Disgusting. Clever but disgusting. But pie is fun. Piecrust can be manipulated and fillings can be bloody red strawberries or cherries. We have a friend with a birthday on the 13th and another with a new baby so now we can make two pies and get rid of them, which solves problem 2. And if I make a Friday the 13th reference on the pie somehow, then I can take a picture and post it here and all problems are solved! 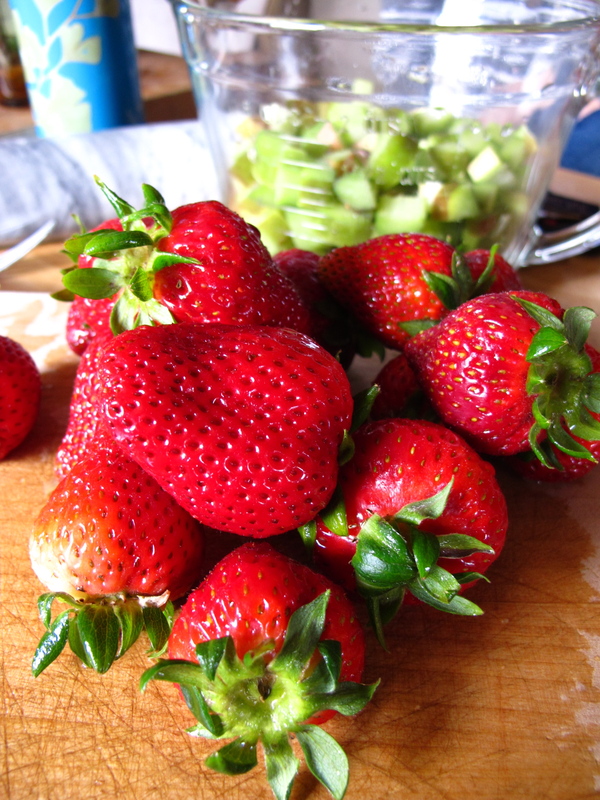 Plus strawberries look really good right now. 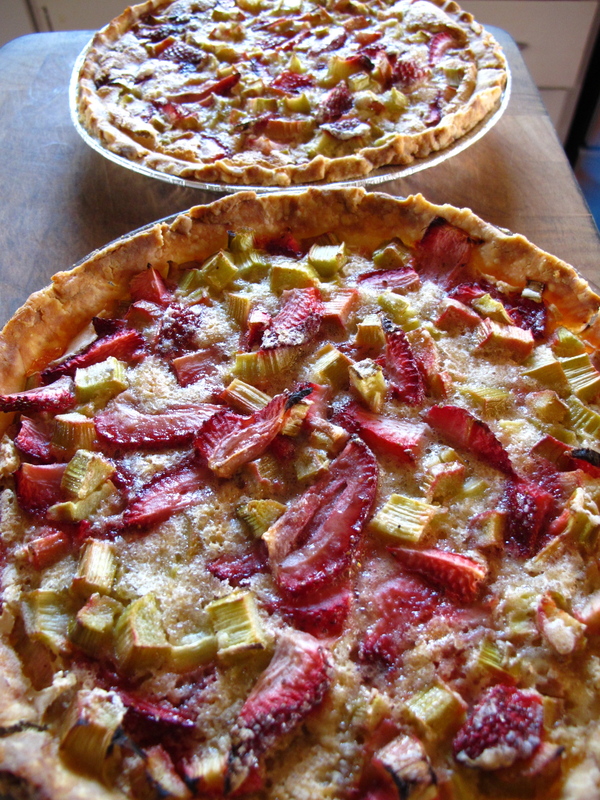 2 strawberry rhubarb, a cherry and a strawberry. So now we have two pies that will stay here (No! No! No!! ), which negates solution 2. 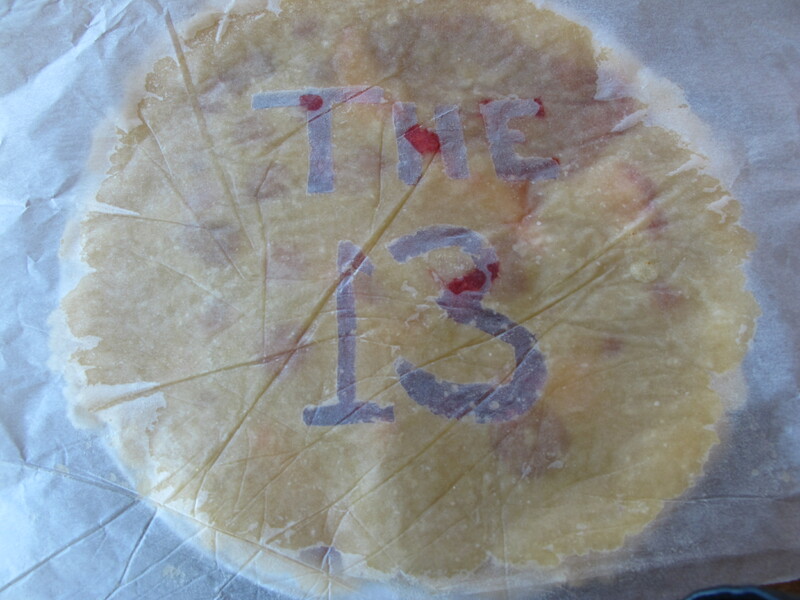 My idea was to write “Friday” in the top of the cherry pie and “the 13th” in the top of the strawberry pie. Ham fisted? Perhaps. But challenging. I had visions of fruit juice gently bubbling out of the cunningly cut little letters, easily readable by all and giving everyone a little laugh. Also, I do believe the phrase “how hard can it be?” crossed my mind, which just shows that I learned nothing from stroked out Darth Vader and his cadre of cupcake friends. Nevertheless, I rolled up my sleeves and started sketching letters on piecrust. 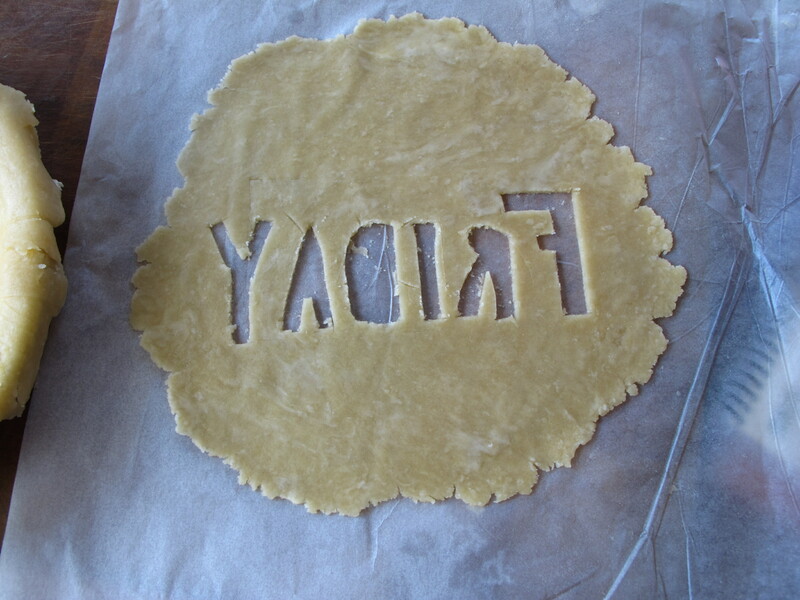 But just as I started to cut, my sister looked over my shoulder and said “You know you can’t do it that way.” She reminded me that the piecrust is rolled out on paper and needs to be flipped over onto the pie; so, either I cut the letters out while it’s on the pie (D-I-S-A-S-T-E-R) or I cut them out backwards so it reads forwards when it’s flipped. Backwards letters in a piece of piecrust. What could be easier? Wait a minute… the 1 is… BACKWARDS! Too late now. I’ll just pretend it’s the influence of my 6 year old niece and her creative writing. What. In. The. Hell. Happened. Here. You’ll note that the Friday pie is neatly contained but I think the 13th pie went through battle in the oven while I wasn’t looking. Happy (?) Friday the 13th. 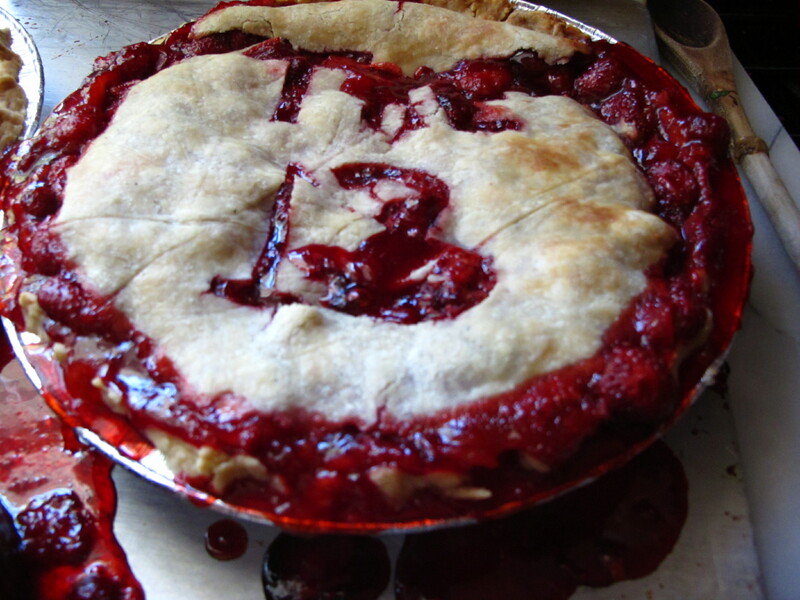 This entry was posted in A Month of Holidays, Baking and Cooking, Bellingham, WA, Friday the 13th and tagged Friday the 13th, Strawberry rhubarb and cherry pies, that oven battle must have been serious, we found someone else to give a pie to!, who else would bake pies for Friday the 13th?. Bookmark the permalink. Great way to celebrate Friday the 13th. The pies look delicious! Wonderful the way the 13th got all gnarly. 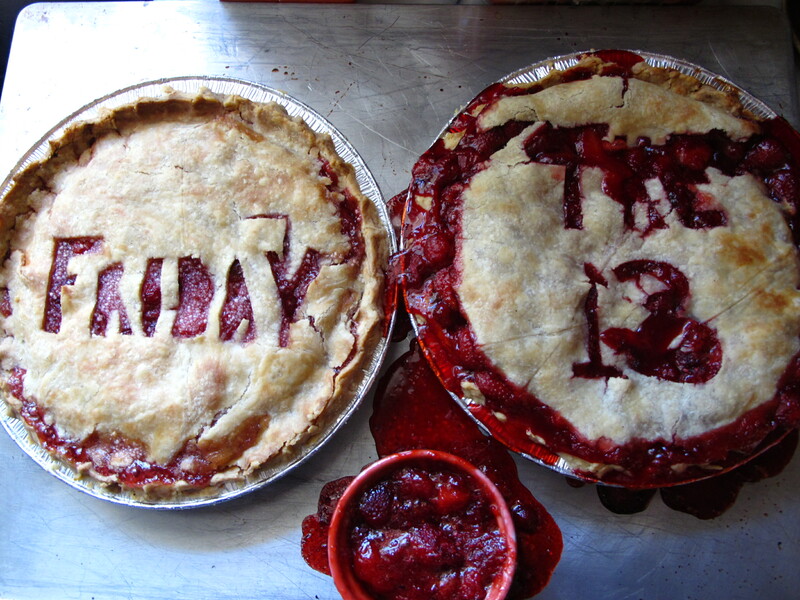 I wouldn’t expect anything less from a Friday the 13th pie. FYI, holidaysinsights.com says that to day is also: Blame Someone Else Day, Frog Jumping Day, and Leprechaun Day. Who comes up with these and why? I don’t have enough time and my readers don’t have enough attention span for me to delve into why people are crazy! Very much a “slasher” pie- like the Friday part was okay, but with the 13th, the monster lost all control. Slasher comments aside, it looks good…good job, keep up the good work. I like the new banner. there was so much that went on yesterday afternoon in this kitchen. wow. and, that friday pie was much like a cherry brick, but still tasted delicious! Note to self: measure everything. And Happy Birthday to me while I eat pie for breakfast. Yum yum! LOVE THE PIES! I think it’s appropriate that the “1” be backwards. Isn’t that part of the cliche of typography for slasher flicks, as though the villains themselves had made the movie title logo and are too deranged or developmentally arrested to get all their “s’s” and “e’s” and such facing the right way? I think Bethany and I are happy about the lack of videographers available to make house calls in Bellingham… :) Sometimes the edited version of something is MORE than enough!